Popular with whale watchers for their animated demeanor and jaw-dropping way they breach the ocean’s surface, the humpback whale can grow to be over 60 feet long, weigh several tons, and can be found all over the world. [i] Despite their magnificence, unfortunately humpback whale populations on the western coast of the United States are some of the few remaining groups of humpback whales still listed as endangered or threatened by the National Marine Fisheries Service (NMFS). [ii] The NMFS has identified fourteen distinct population segments of humpback whales, four of which have been listed as endangered. [iii] One of these whale populations is thought to have just over 400 individuals remaining. [iv] Currently, a group comprised of Native Americans and environmental organizations have filed suit alleging that the NMFS has failed to designate, and take measures to protect, a critical habitat for the humpback whales within one-year of the animals listing as required by the Endangered Species Act (ESA). 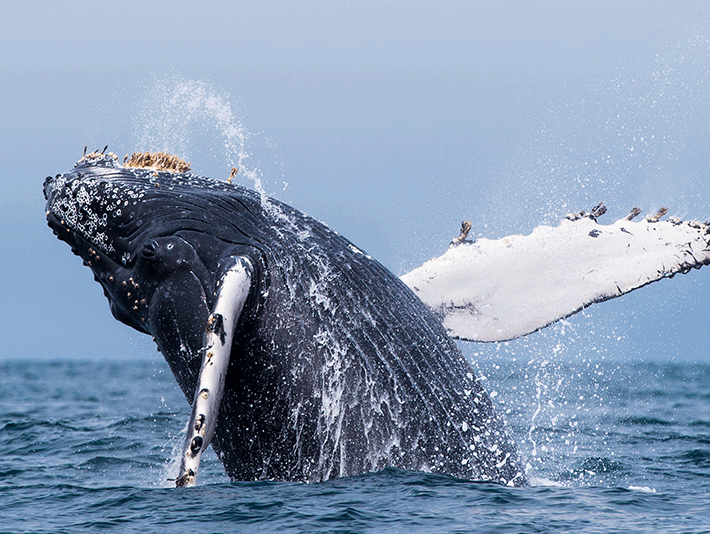 [v] This lawsuit is necessary for the preservation of the distinct populations of humpback whales. Without the designation of a critical habitat, the chances of extinction will rise. These whales are an important part of the culture of the Chumash—Native Americans who have historically relied upon humpback whales to help them navigate at sea. [x] Now the Chumash are giving back and playing a strong role in protecting these whales that once helped them. [xi] The whales are being killed at an alarming rate by fishing gear, cargo ships, and oil spills. [xii] Additionally, recent oil spills have become a new threat to these whale’s survival. [xiii] Without action, the survival of these whales is in jeopardy. [iii]Humpback Whale, NOAA Fisheries (Jan. 10, 2017), http://www.nmfs.noaa.gov/pr/species/mammals/whales/humpback-whale.html. [iv] Center for Biological Diversity, supra note ii. [v] Perter Fimrite, Suit Says Trump Administration Failed to Protect Humpback Whales, San Francisco Chronicle, (Mar 17, 2018, 2:24 PM), https://www.sfchronicle.com/science/article/Suit-says-Trump-administration-failed-to-protect-12761400.php. [vi] Identification of Distinct Population Segments of the Humpback Whale and Revision of Listing, 81 Fed. Reg. 62,260 (Sept. 8, 2016) (to be codified 50 C.F.R. pt. 223, 224). [x] Morgan Gstalter, Native American, Conservation Groups Sue Trump for Failing to Protect Humpback Whale Habitat, The Hill (Mar. 17, 2018 6:32 PM), http://thehill.com/policy/energy-environment/378968-native-american-conservation-groups-sue-trump-for-failing-to.